"Are video games art?" asks MoMA. "They sure are, but they are also design." 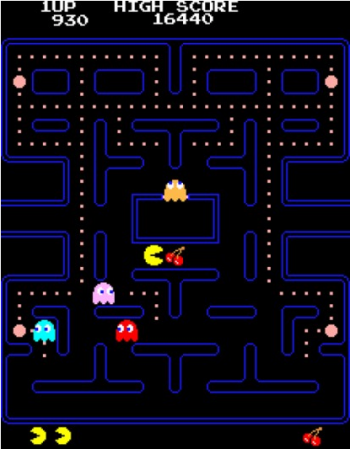 Pac Man and thirteen other titles, ranging from Tetris to Portal and EVE Online, have been acquired by the Museum of Modern Art in New York, as part of its new category of artworks. Nor is that where MoMA intends to stop; it has forty other titles on its wish list, including veterans like Donkey Kong, fan favorite Grim Fandango, and relative newcomer Minecraft, among others. MoMA chose a design approach for its latest venture. "The games are selected as outstanding examples of interactive design," says the Museum in its announcement, "one of the most important and oft-discussed expressions of contemporary design creativity." It doesn't want games that just look good or play well; it wants games with elegant code, and ones which take the player's behaviour into account. Which is why, says MoMA, some of the games on its list aren't necessarily the ones video game historians would consider easy picks. Some of the games on display will be playable, others not, depending on length of gameplay and sometimes also fragility of format. If you were hoping to play Dwarf Fortress at MoMA, prepare yourself for disappointment; that's something more likely to be on demo display. Passage, on the other hand, and games like it will be playable in their entirety. MoMA's Architecture and Design team will have the initial selection on display in the Philip Johnson Galleries by March 2013. If you want to know more about the exhibit and how the games MoMA picked were chosen, have a look at MoMA's official announcement.